Description: 188 and 198 pose at Main Street station. Description: Metra 198 is ready to go at Main Street Station. Description: Metra 198 outbound before she reappears. Description: Here's 198 before she essentially turns around on a Diverging Approach Diverging path and comes back. Description: 198 is back for more! At this point the engineer had yet to exit the cab. Description: 198 and I look on as a westbound enters, not yet visible. 198 will begin to back away as I fire the shutter. Description: An older cab car hits a snow bank at Main Street, sending snow flying. The flag is at half staff for victims of the tsunami in Asia. Description: Accelerating backwards past all us railfans. Description: The one in the hoodie kept looking at me funny. I don't know why people can't accept that it's what I'm doing. Description: Metra 198 waits for passengers to board at Main Street Station. Description: Metra F40PH 198 highballs through the Zoo Stop passing two reminders about what this stop was built for to the left of the engine. Description: Inbound dinky running in reverse passes Lavergne Station with another train approaching in the distance. 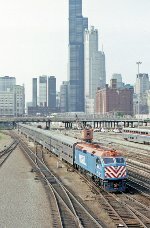 Description: Metra 198 blasts by some welders as it departs Chicago Union Station for Aurora.